During our childhood the suit, boot and tie were associated with the English, the higher officials and the movie stars. We as children were mostly dressed in shorts and shirts and sometimes with rubber slippers. Most of the time we walked barefoot – to beat the water and mud splashing on to our clothes from the slippers and at many a times due to the fear of losing the slippers. May be we always forgot our slippers home as it proved to be an impediment to faster running and climbing trees. Wearing a suit and the boot always remained a distant dream. On joining Sainik School at the age of nine, we had to wear the shoes at all times and it took me a lot of effort and time to get used to my feet being covered with the socks and the shoes. Then we were all measured by the tailors and after three months we all got our suits. A dream came true to most of my friends and me. We all wore our coats with the school insignia with a lot of pride during the winter months. In the next letter I shot off home, I wrote as to how different (smart) I looked in my coat. At that time one never realised that this piece of dress was going to be on me for a long time to come – over thirty years. On my first vacation home I realised as what this change had done to me. I could not step out on to the courtyard of our home or walk along the paddy fields or climb trees barefooted as my soles had gone soft due to constant wearing of socks and shoes. That is when I realized that the socks and shoe had also become an integral part of me rather than being a piece of dress. This trend with the clothes continued at different stages of my military career, at the National Defence Academy, Indian Military Academy and with the army unit I was commissioned into. Every where the tailors measured me and I got a new suit every time. While attending various courses in the army in different parts of the country, one realised that each military station had a set of tailors waiting to measure you and provide you with a new suit. Most of these military stations were established by the British Army and had the best climate and picturesque sceneries. Some of these tailors stitched the suits and would put Armanis to shame, as they and their forefathers had been in this business of suit making from the era of the British Army. They were ready to finance you and would accept post-dated cheques for over a year to make good your bill. Those were the days when credit cards and credit ratings were non-existent. These tailors had a system in place and the only credit check they needed was your credibility as an Indian Army officer. The customer service they provided was exemplary compared to any standards of today. They seemed to know all the officers of our units as they also had made suits from them. They would alter or repair your suits at no cost which were send through other officers of the unit who went for the course. May be it would be an interesting research subject for the management students like the “Dabbawallahs of Mumbai”. Wearing a suit was mandatory for us in the army for many a formal occasions. The dictum for us was that it is safer to be formally dressed in an informal occasion than being informally dressed for a formal occasion. 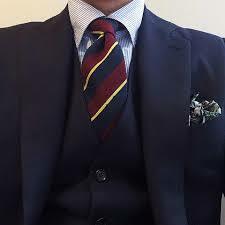 A tie was always a saviour that at many a times it converted an informal attire into a formal one. To help me overcome this dilemma, my driver was always handy. He always carried a set of ties during the summers and a suit during the winters. While being driven, I could comfortably switch from informal attire into a formal one in minutes. On retiring from the army, I thought it was time for me to shed my formal attires and become comfortable in the informal dresses. When I took my flight to Canada, my baggage did not have any suits or ties. On landing in Canada in the summer, I was happy to find that most men were casually dressed in their shorts and sandals and I too followed the dress code. My neck and feet must have enjoyed the wimp of fresh Canadian air. The few men I found dressed in their suits were the real-estate agents or insurance agents. The offices I went for my initial documentation all had people dressed in semi-formal clothes or work clothes and not in their suits. On Sunday, I went to attend the Holy Mass at the Syrian Orthodox Church in Toronto and I found many men dressed in their Sunday’s best suits. The curiosity in me made me to ask a young man as to why he is wearing a suit to the church. He said as to where else will he ever wear a suit other than to the church. He narrated as to how he got two suits stitched. Based on the advice he got from a few friends that it would be much cheaper to get the suits in India than in Canada, he got two stitched. He said he came to Canada with the impression that every one wore suits, but after landing, he realised that he needed working-overalls and safety boots and not the suits. Now where else will he wear the two suits he got stitched other than to the church on Sundays.